Your CRM should make interactions with customers simpler. While management and marketing are often onboard with the idea of a CRM system, sales staff may need more persuading because at the initial stages of implementation. It can feel like there’s more administrative tasks to undertake which may be slowing down the process. A good CRM will offer key functionality which improves current processes making them more efficient for example, instant access to client data. Considering that data accessibility for salespeople shortens their sales cycles by 8-14%, a CRM is likely to help salespeople close deals at a faster rate. 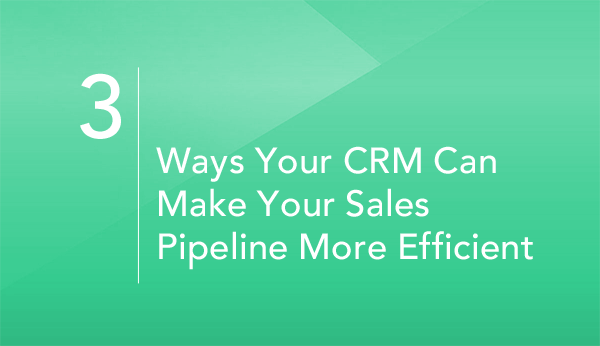 One of the clear advantages of a CRM is that it can help your sales team drill down into essential information. As a salesperson, being able to see all relevant information about a client in one place is valuable because it cuts down the time spent pulling data from separate sources. Centralized customer data which charts historical interactions means that communicating with current and prospective prospects is much easier to coordinate. This is important because lead nurturing is an essential component of a smooth sales pipeline. A study from Forrester asserted that companies that excel at lead nurturing generate 50% more sales-ready leads at 33% lower cost. Your CRM should increase productivity and drive sales which in turn should positively impact the growth of the company. Any salesperson knows there’s an art to sending a sales email. But when your emails integrates with your CRM, life is made much easier still. The ability to schedule follow up reminders is key when your sales teams are dealing with a large group of contacts, particularly if they span different countries and time zones. Access to your CRM shouldn’t be confined to the office only. Salespeople need the option to be able to use the CRM system remotely – with access to data offline – whether they’re on the road or visiting a client on-site. A study by Innoppl Technologies found that 65% of sales reps who have adopted mobile CRM have achieved their sales quotas. While only 22% of reps using non-mobile CRM have reached the same targets. When comparing CRM systems, consider mobile friendly options which offer sales people the flexibility they need to follow up on leads in a timely manner and to stay on top relationships with new and existing clients. The ability to check where clients are on the sales pipeline quickly and effectively is vital to the success of any sales department, especially in a competitive market. Lauren Stafford is Digital Publishing Specialist at Discover CRM, which brings together news, research and opinion on CRM software.